The photos featured below were taken in Durban, South Africa, last year. The occasion was the United Nations conference on racism, where both Israel and the U.S. delegations walked out after Israel had been branded a “racist” state. 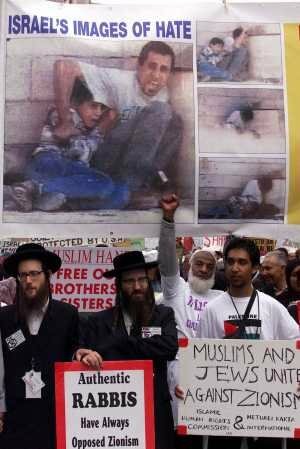 Not all Jews were in agreement though; as the pictures below reveal there are Jews opposed to Zionism and the state of Israel. Unsurprisingly though, these protests received hardly any coverage in our “free press” – largely because the media is owned by Zionists like Rupert Murdoch. So it’s important to emphasise that not all Jews support Zionism or even the state of Israel. 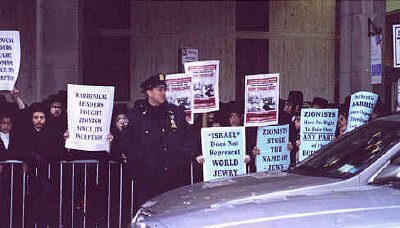 Meanwhile an estimated 20,000 Orthodox Jews demonstrated on Tuesday February 12th, 2002, in front of the Israeli Consulate in New York City. Organized by the Central Rabbinical Congress of USA and Canada they voiced their opposition to the existence of the state of Israel, its suppression of religion and brutality, but once again the mainstream media totally ignored this protest. “It is openly stated in books written by the founders of Zionism that the means by which they planned to establish a state was by instigating anti-Semitism, and undermining the security of the Jews in all the lands of the world, until they would be forced to flee to their state. And thus they did – They intentionally infuriated the German people and fanned the flames of Nazi hatred, and they helped the Nazis, with trickery and deceit, to take whole Jewish communities off to the concentration camps, and the Zionists themselves admit this. (See the books Perfidy, Min Ha Meitsor, etc.). The Zionists continue to practice this strategy today ,they incite anti-Semitism and then they present themselves as the “saviours”. Here are two replies given y Leaders of the Zionists during World War II, when they were asked for money to help ransom Jews from the Nazis. Greenbaum said “One cow in Palestine is worth more than all the Jews in Poland.” (G-d forbid).